As 2018 draws to a close, we reflect with gratitude on a year filled with much learning, music and dance. The long-awaited blessing of Dharma Swara’s new instruments — and we kick off our new season with a party! Won’t you support our dancers? Help them build on their skills, artistry…and wardrobe! We are thrilled to announce our collaboration with composer, Joel Mellin on a new piece for gamelan semara dana and dance thanks to the Jerome Fund for New Music & Emerging Artists. Joel is one of ten composers to receive this year’s fund and we couldn’t be happier for our friend and fellow gamelan brother. This will not be our first foray in the world of Mellin compositions - ‘Synesthesia’ featured in Gamelan Dharma Swara’s performance repertoire in previous seasons. Needless to say, we are extremely excited to work on this new venture and look forward to presenting it to the world. 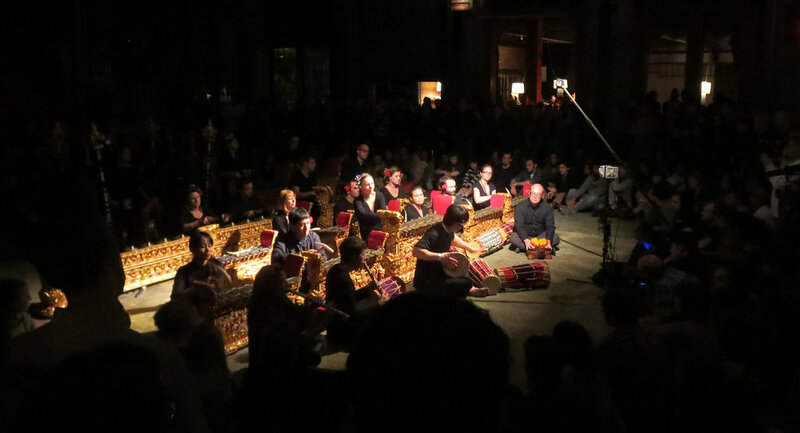 What is a Community Gamelan? As a student and performer of gamelan for over a decade, I have struggled to succinctly answer this question, especially as it relates to Gamelan Dharma Swara (GDS), the New York-based Balinese music and dance ensemble to which I have belonged for nearly as long. When I joined GDS in 2007, the idea of a community ensemble was fairly easy to comprehend: in my teens I participated regularly in the community band, performing flute and piccolo at the local park during the summer months. The band was made up of my friends and neighbors, young and old; we played John Philip Sousa, and the vibe was casual. When GDS was founded back in the 80’s, it was indeed a community ensemble, and when I became a member some fifteen years later, it had maintained this profile even as it became increasingly renowned for its performance of mainly traditional repertoire. But in the years since, Gamelan Dharma Swara pursued exceptional opportunities that have consequently fueled new ideas about our potential, artistic and cultural impact, projects, and how we engage with audiences. Most notably, an invitation to perform at the Bali Arts Festival in 2010 validated our ability to bring a new level of discipline and dedication, and achieve astonishingly high levels of artistic and technical execution in front of discerning Balinese audiences. Then in 2014, we performed at Basilica SoundScape–billed as an “immersive, innovative weekend of art, music and culture”–which prompted us to think more deliberately about the work we do in the context of the larger pop culture landscape, how our audiences experience our performances and interact with our ensemble. In this light and only recently President of the ensemble, I appreciate more fully the obstacles to simply stating what we are and do as a matter of community, and yearn to engage ourselves in dialogue as to how we contend with them in the course of my leadership and beyond. The word “community” is a loaded term, and assumes specific connotations in performing arts, some of which fairly reflect the collaborative ethos of GDS, yet fail to illustrate our ensemble’s high ambitions. None of our members perform Balinese arts for a living–and admittedly our model does not facilitate this sort of reality either–but gamelan is far from being a hobby for many of us: it is a serious dedication of time and pursuit of artistic expression, discovery, and excellence. Now more than ever it is leaning in the direction of adopting a “professional” mentality or approach without it being that in name. As part of ensemble leadership, I hold responsibility to nurture a passion for learning and performing the Balinese arts among our members, and enable an environment that facilitates such on an ongoing basis. In the days since our ambitions have grown, so, too, have the number of complex organizational topics with which we have had to contend (eg. do any members of a certain skill level or contribution receive compensation and, if so, when? ), and so, too, have we realized that circumstances from which we had previously benefited (eg. free rehearsal space, strings attached), were now undermining our goals and overshadowing the joy that membership in the ensemble ought to bring. These challenges and our various responses to them caused the last few years to feel like an extended period of transition without a timeline for relief, and ultimately prompted leadership to embark on this study to find answers. These actions notwithstanding, our work is not and never done. Some members will inevitably leave, and new members will eventually join; our circumstances and objectives may accordingly change. Regardless, I believe the insights set forth in the study are relevant for us and other ensembles at any time, and as a new leader, I am eager to build upon them to re-establish a strong foundation for GDS–community gamelan or not. Indeed over the course of this study, I’ve come to terms that what matters least is fitting neatly in others’ understanding of “what is”, and that we must cultivate our own definition, while maintaining a healthy perspective that doing so will require a generous capacity for experimentation, patience, and optimism. As participants or supporters of music- and arts-making, we all share an interest in cultivating, touching, and engaging community–and we are a community unto itself. My hope is then that you will find the study of interest, perhaps come to additional conclusions for GDS, your ensemble, and even ensembles at large. And should it be so, know that you are among friends who are eager to hear your perspective.